On polishing tiles “ .. for glazed ones, colourless wax polish is excellent. For red, unglazed ones, a special tile polish is sold”. We must not forget to “Rub up the floor surround last of all”. 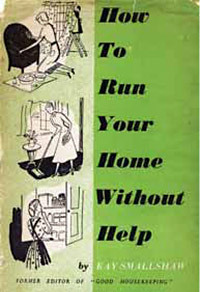 Kay Smallshaw’s How to Run the Home without Help was published because, firstly, the pre-war days of maids, servants and housekeepers had vanished never to return, and middle class housewives found they had had no idea of how to cope. A perfect illustration of one such bewildered housewife is Laura in One Fine Day by Mollie Panter-Downes, surely one of the most elegiac descriptions of post-war country life ever written. Secondly, it was written for those women who were now consigned back to the joys of the kitchen sink and the ironing board because the jobs they had held during the war were now needed for the men who were coming home. Kay Smallshaw’s book would have been an invaluable help for these wives who were just as helpless as Laura when it came to running a house. The modern day woman might automatically assume that this return to domesticity was resented by all women. Not so. Though we might find it difficult to believe, there were ‘some young wives who had spent their girlhood as a conscript or a directed worker and asked nothing better than the kind of routine which her mother had found so frustrating and imprisoning’. The housewife was ‘quite willing to stay at home…. It was one of the things she had dreamed of when she had rushed to clock in or clip tickets on the first bus’. (A Woman’s Place - Ruth Adams- Persephone). It is to be hoped that this enthusiasm was maintained after polishing unglazed tiles with special tile polish and rubbing up the floor surround….